When it comes to protecting our mattress, using a mattress protector is a must. However, do you know how to wash a mattress protector and how often you need to? ​Can You Wash a Mattress ​Protector? ​Can You Wash a Mattress Topper? First of all yes, you can definitely wash a mattress protector like you would your new set of sheets​​​. That is the main reason for having one, since you are unable to wash your mattress. While sleeping, we lose fluid, skin cells and any dirt on our bodies will rub off in the sheets. These tiny particles will push tough the fibers as we toss and turn, eventually making their way down and into the mattress. Once inside of the mattress, it is almost impossible to pull it all back out, even with spot cleaning and vacuuming the top of your mattress. Instead of having to worry about what's falling through the cracks of your mattress ​and ​degrading its lifespan, opt to own and use a mattress protector. A mattress protector is a thin fitted sheet that goes on your bare mattress and sits underneath your fitted and flat sheets. Most ​of the top rated mattress protectors are 100% waterproof and can hold more than a liter of liquid before you need to change it. They are also engineered to be breathable through a cotton/terry blend that absorbs yet allows air to flow through so that you are not sweating due to the extra layer underneath you. 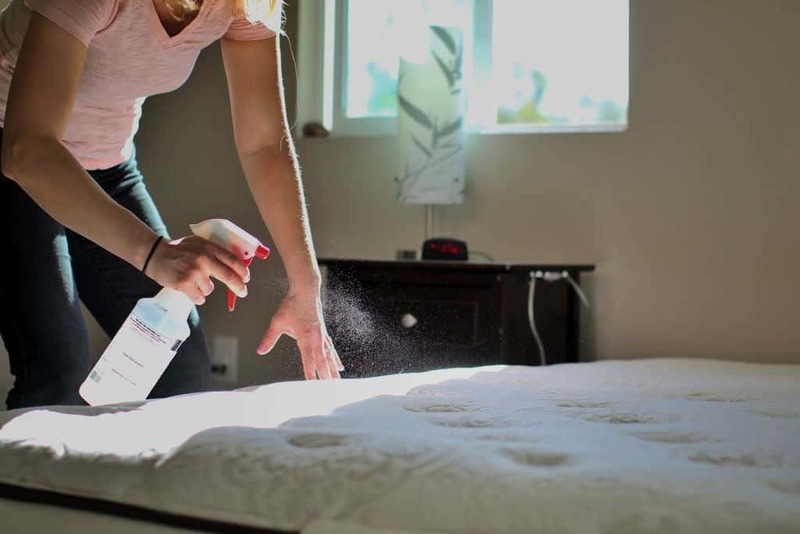 Whether you need to spot clean or completely launder your mattress protector then follow these steps to take care of spills, stains and regular refreshing. If you catch spills or accidents in time, you can spot clean your mattress protector instead of having to wash it between scheduled washes. The best way to be able to spot clean is to do it as soon as the accident occurs or as soon as you notice it. Putting off spot cleaning may result in set in stains or permanent yellowing of your mattress protector and needing to wash it instead. Do not rub the area, this can damage the mattress protector fibers and spread the stain further. .Dip the soapy cloth in clean water and squeeze out the excess and repeat until there is no more soap on the mattress protector. Follow up with using paper towels to blot out any excess moisture to help your mattress protector dry faster. Allow it to air dry by hanging it up. It is important to control how much water you are using to spot clean. You don’t want to over soak the area with detergent or water, this won’t clean it any better and will take a longer amount of time to dry. Less is better, because you can always work up to using more if needed. You cannot work backwards from over soaking the area or adding too much soap. Also spraying too much detergent or not watering it down a little can cause too much soap residue to get into the fibers and be difficult to remove it all. More soap does not mean cleaner, it just equals out to more work needed to rinse it. You should strive to wash your mattress protector once a month. You can stretch it to once every two months if your sheets are changed regularly and you don’t have many spills or accidents. Your mattress protector needs to be laundered regularly due to the buildup of dirt, dead skin cells, dust mites and odors. Washing your mattress protector will also restore the freshness of it to keep allergens under control. Set your washer to the cold water and gentle/delicate cycle. Place your mattress protector in the washer with your sheets or alone. Let the washer run through the entire cycle and skip the fabric softener, this will reduce the absorbency of the mattress protector. The best thing you need to remember about washing your mattress protector is that you need to avoid high heat settings. Similar to washing wool, and other sensitive materials, ​washing or drying with heat​ can damage the waterproof backing, shrink it and reduce it’s ability to protect your mattress. If you have a mattress topper, it is a little different from a mattress protector. A mattress topper, sometimes referred to as a pad, is a padded cushion that fits on your mattress like a fitted sheet would. The main difference between the two is that a topper is used to add a layer of cushion to your mattress where as a mattress protector adds little to no cushion and offers waterproof protection. A good mattress pad will make your night's sleep a lot better. It doesn't provide any protection for your mattress though. You can wash most mattress toppers. Cotton and polyester blends are able to washed and dried following the same instructions as above. Since it is a thicker version of a mattress protecter it may need to be dried a little longer. Now that you know more about how to wash a mattress protector and the best schedule for taking care of it, you can begin to work it into your cleaning routine. Keeping your mattress protector clean and functioning will help extend the life of your mattress underneath since it is catch all of the daily wear and tear.